There is only one Unistrut Metal Framing System. It incorporates the innovative product improvements that our research and development group has created to give you the most complete and flexible support system available. Backed by our worldwide network of engineering and distribution centers, Unistrut provides customers with total-resource capability. Wildcat Electric carries a broad range of Unistrut products. Click here to request a quote or ask about Unistrut Solutions or call 713-676-0600. We invented it. The one you know, the one you trust, the one you ask for by name… Unistrut, accept no substitute. Hex-head bolt threads easily into a spring nut, connecting fitting to channel in one quick one-hand operation. Chamfer in the nut eases starting of the bolt. Nut teeth create a strong, vise-like grip when tightened against the inturned channel edges. Channel edges and the nut's tapered grooves act as guides to provide fool-proof alignment of connection. Nut teeth create a vise-like grip, tying sides together in a strong “box” configuration, when the nut is tightened against the in-turned edges. Spring allows precision placement anywhere along channel length, then holds the nut in position while connection is completed. Strut channel, often referred to colloquially by one of several manufacturer trade names, Unistrut is a standardized formed structural system used in the construction and electrical industries for light structural support, often for supporting wiring, plumbing, or mechanical components such as air conditioning or ventilation systems. 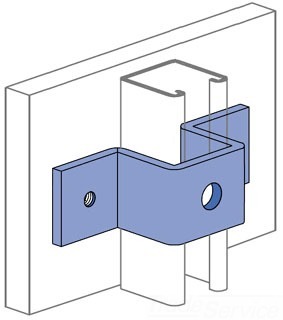 A strut is usually formed from a metal sheet, folded over into an open channel shape with inwards-curving lips to provide additional stiffness and as a location to mount interconnecting components. Increasingly, struts are being constructed from fiberglass, a highly corrosion-resistant material that's known for its lightweight strength and rigidity. Struts usually have holes of some sort in the base, to facilitate interconnection or fastening strut to underlying building structures. 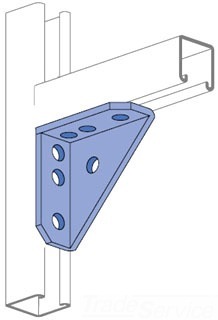 The main advantage of strut channels in construction is that there are many options available for rapidly and easily connecting lengths together and other items to the strut channel, using various specialized strut-specific fasteners and bolts. They can be assembled very rapidly with minimal tools and only moderately trained labor, which reduces costs significantly in many applications. A strut channel installation also can often be modified or added-to relatively easily if needed. The only alternative to strut channels for most applications is custom fabrication using steel bar stock and other commodity components, requiring welding or extensive drilling and bolting, which has none of the above advantages. In US units, the basic typical strut channel forms a box 1 5/8 inch by 1 5/8 inch. In metric units, this is a 41 mm by 41 mm unit. There are several additional sizes and combined shapes manufactured.